19 Bella occupies the diminutive space and out-of-the-way location formerly inhabited by Restaurant Rosalie (and several other establishments), which I reviewed in December 2009, and which subsequently closed in February 2010. But whereas Rosalie – a truly wonderful restaurant, I might add – went begging for customers, 19 Bella seems to be beating them off with a stick. Practically from the moment this place first opened its doors, it has been packing them in. 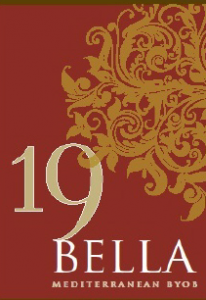 Why has 19 Bella apparently succeeded where others have failed? Several factors seem to be a work. First of all, chef/proprietor Grant Brown, formerly of the Blue Horse in Blue Bell and Philly’s Meritage, is quite well known in the area. Secondly, the restaurant’s Mediterranean tapas cuisine (small plates of appetizers and snacks that originated in Spain) is all the rage right now. And, finally – and most importantly – the food here is incredibly good. Put all these things together and you obviously have a recipe for success. The menu is divided into four categories: Vegetables, Fish & Shellfish, Meats & Poultry, and Soups, Salads and Starches. It is recommended that patrons choose three or four small plates, which are equivalent to a traditional meal; or they may place themselves entirely in the chef’s hands by ordering the “Menu of Confidence,” five courses priced at $45.00. One thing is certain, however, you won’t go away hungry. The kitchen is more than generous in its apportionments. Among the “must-tries,” the fried dates steal the show ($7.50). 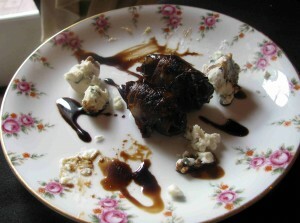 They are fried wrapped in bacon and then garnished with dabs of port wine glaze and crumbles of blue cheese. This may seem like an odd mishmash of ingredients, but the combination of taste and texture works like a charm. For those in search of comfort food, it’s difficult to beat Morgan’s mac & cheese ($6.50). 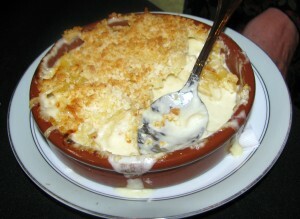 It’s decadently rich & creamy and topped with crisp crown of breadcrumbs. There’s mac & cheese and mac & cheese; and this is the real deal. Seldom have I encountered a version so ultimately satisfying. This dish alone is worth the price of admission; and, as you may note from the photo, the portion size is especially generous. Seafood lovers have a variety of interesting items from which to choose: sautéed Spanish shrimp with spicy saffron garlic sauce ($9.00); Thai seafood stew, incorporating shrimp, scallops, mussels, and clams in a red curry broth spiked with kieffir lime leaf ($9.50); Mediterranean lump crab cake companioned by romesco sauce ($9.50); salmon, prosciutto, and red onion skewers ($8.50); and paella Barcelona, a combo of shrimp, clams, scallops, and chorizo sausage on a seabed of pork-saffron rice ($12.00). And meat & poultry lovers are certainly not shortchanged. The grilled lamb chops are prepared with a Greek flair and kissed by a red wine sauce and hint of dill ($12.50); the Spanish pork stew is embellished with apricots, cracked green olives, and oranges and clementines ($8.50); the classic veal saltimbocca is served with a Madeira & sage sauce ($11.50); and the grilled prime New York sirloin is spruced up with an assertive bourbon & morel mushroom sauce ($15.00). 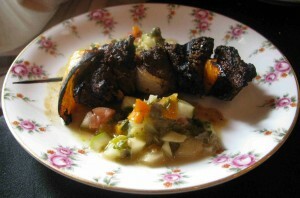 But my nod in the red meat department would go to the beautifully prepared beef shish kabob, tender morsels imbued with zesty Mediterranean spices and garnished with Chef Roger Verge’s provocative creosa relish ($8.00). Among the odds and ends, the Bulgarian shopska salad – chopped tomato, sweet peppers, chives, cucumber, feta, and fresh herbs tossed with a red wine vinaigrette ($8.00) – is a sure winner… ditto the Caesar salad prepared tableside ($11.00). 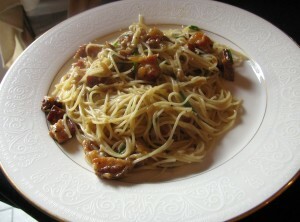 And pasta fans will find it difficult to resist the appetizing attributes of spaghetti carbonara ($8.50). The only problem food-wise proved to be the tiramisù, a rich mélange of ladyfingers soaked in a coffee-Marsala mixture and then layered with mascarpone and grated chocolate. The ladyfingers, however, which should have been soft and moist after their liquor-infused bath, were, inexplicably, as hard as rocks; and the dessert had to be sent back to the kitchen twice and was eventually removed from the check. Apart from the cuisine, however, which generally acquits itself superbly, there are a number of other issues. The food emerges from the kitchen willy-nilly, as it is prepared, in no apparent order. It also, at times, does so at a fast and furious pace. And since the restaurant urges patrons to order three or four plates each, a party of four could run out of table room at the speed of light… which is infinitely more conducive to organized chaos than relaxed dining. Overall restaurant space – or lack thereof – is an issue that is certain to rear its ugly head in the coming months (if it has not already). During warmer weather, if there is no precipitation, patrons may dine alfresco. But with the coming of fall and winter, outdoor dining is no longer an option. Given, as noted at the outset, the establishment’s diminutive dimensions – and its popularity – tables here will be much in demand… But potential diners can only fail to secure reservations so many times before 19 Bella’s celebrity status becomes a liability rather than an asset. I have no doubt that management will be scrambling to secure more spacious accommodations. Finally, and perhaps most troubling of all, I found the hostess/co-proprietor’s attitude rather off-putting. She wasn’t exactly rude… but she wasn’t terribly welcoming either. So much so that, while we awaited our friends’ arrival, I seriously considered calling another restaurant in the area to see if we could secure a table at the last moment. 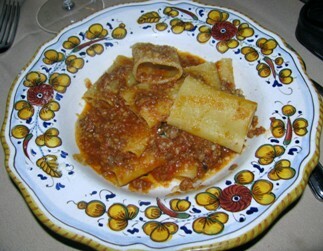 There is absolutely no question that 19 Bella is a fine restaurant, offering its patrons excellent cuisine and generous portions at – given the quality of the food – more than reasonable prices. Once a few of the aforementioned kinks are worked out, it will surely be a culinary force to be reckoned with.